I recently got the chance to sit down and talk to Andrew Torba, CEO of Gab.ai, a new freedom of speech-focused social network. Though the Twitter-style network was only launched last Monday and is still very much in early beta, thousands of people are currently waiting in line for an invitation to the service, which aims to act as a shelter for freedom of speech and expression. Charlie Nash: Censorship has been rampant on social networks such as Facebook and Twitter for quite some time now. What was the final straw that pushed you into developing Gab.ai? Andrew Torba: If I had to pick a single event that pushed me over the edge to take action, I would have to say it was the suppression of conservative sources and stories by the incredibly biased Facebook Trending Topics team. Many of us don’t realize just how much power and influence the News Feed and Trending Topics products have on our psychological understanding of the world around us. There are hundreds of millions of people who get their main source of news and information from a handful of companies in one of the most progressively liberal cities in the world, it’s time for a change. CN: You’ve already attracted thousands of people who are currently waiting in line to join the social network. Has their reaction been mostly the same? Would you describe them almost as digital refugees looking to leave the totalitarian regimes of Twitter and Facebook? AT: It’s been an incredible week, in just four days 10,000 people registered for our beta through nothing but word of mouth. Our mission is to put people and free speech first. That mission statement is connecting with tens of thousands of people not only in the United States, but around the world. The sentiment and feedback has been phenomenal and very exciting. It’s also refreshing to see that this issue of censorship is not strictly limited to conservatives as many progressives are also joining Gab and expressing interest in a user-first, pro-free speech platform. CN: A few of the Breitbart Tech guys, including myself, are already over there testing it out. Have you seen much interest in other media professionals or public figures? Will we see Mike Cernovich, Adam Baldwin, or Julian Assange there soon? AT: At Gab we welcome anyone who wants to speak freely. 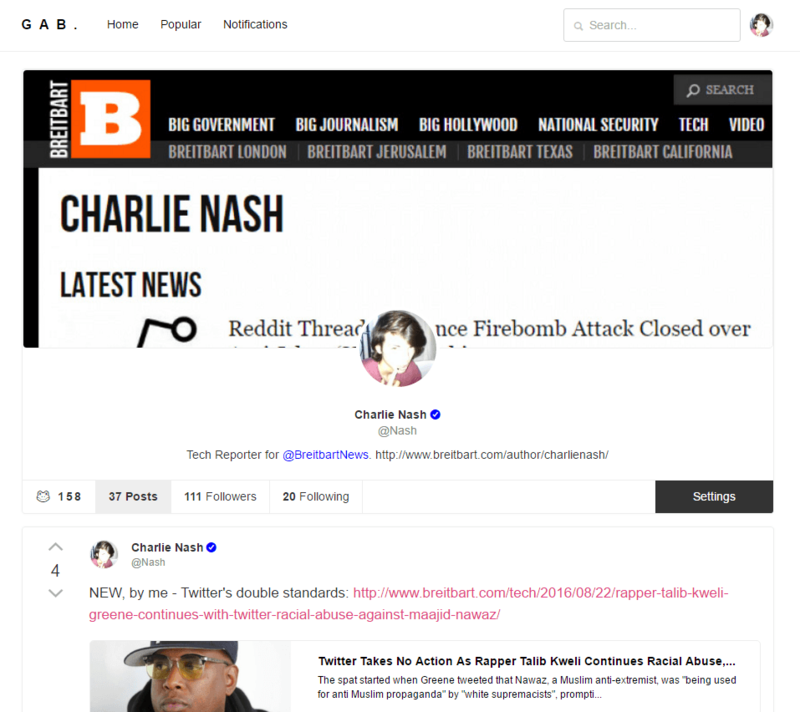 One of our new users today is Kassy Dillon, a conservative influencer, who has experienced the censorship of Twitter directly. We are actively reaching out to influencers from all backgrounds who are searching for an alternative. We welcome everyone and want to encourage open, honest, and authentic discourse on the internet. CN: You currently have a much more different approach to verification, unlike Twitter or Facebook. You’re giving the checkmark to people who should have had it on platforms such as Twitter or Facebook, like any journalist or public figure, however were never given it due to their politics. You’re also giving it to normal members of the public who can verify that they are real, even if they wouldn’t normally meet the professional or social criteria for verification on other social networks. Do you think this will speed up the process of bringing over influential figures and media professionals? AT: Unlike other social networks, we don’t use verification checkmarks as an elitist social ranking system. We use them for one purpose – verifying identities. Currently, we verify accounts if they have a high likelihood of being impersonated, but very soon every Gab user will have the ability to verify their identity if they so choose. We believe that when people verify their identity they are much less likely to harass others. It’s easy to harass folks online behind an anonymous profile, but much more difficult to do so when your name is attached. We want to make sure everyone on Gab can find who they want to find, and protect their identity or brand. That being said there is no requirement to verify your identity. We believe anonymity is important for some to feel comfortable expressing their right to free speech, and we don’t want to infringe on that right. CN: You said in the launch post that gab.ai will never bow down to political or otherwise avoidable censorship, and that you’ll remain a service for the people. Do you intend on taking an 8chan-style view on content, and only removing things that are illegal or dangerous? AT: We believe that the only valid form of censorship is self-censorship, an individual’s freedom to opt-out. 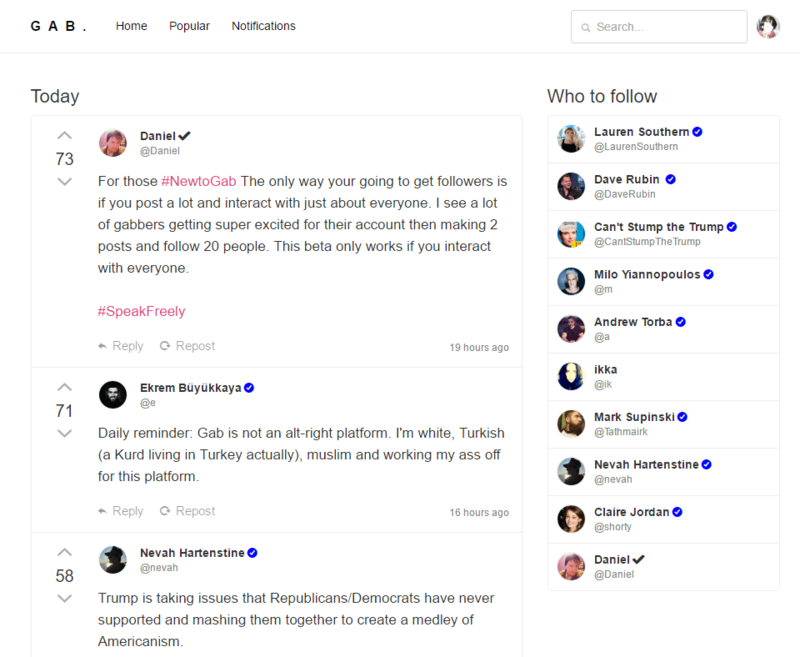 Gab empowers users to self-censor and remove unwanted followers, words, phrases, and topics they don’t want to see in their feeds to help stop and prevent different forms harassment. 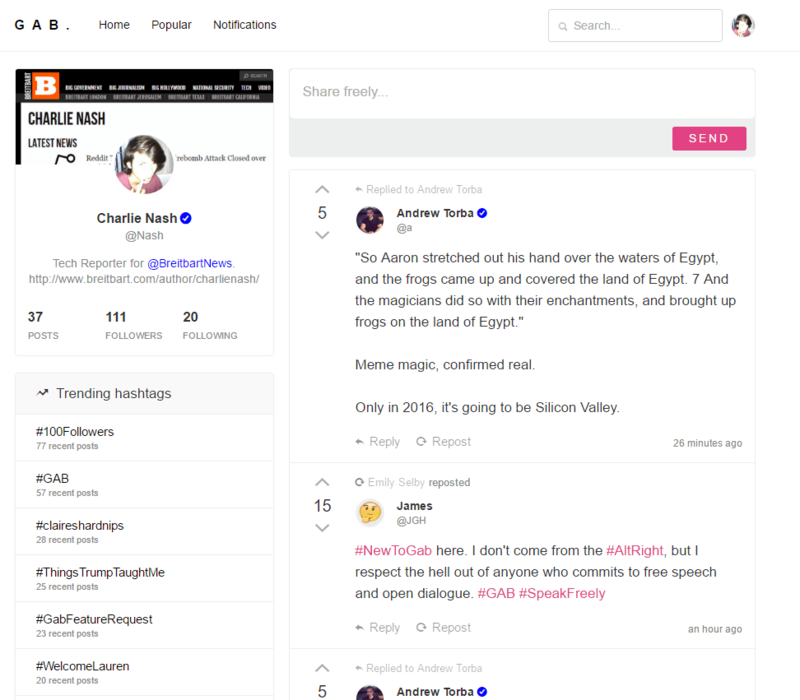 CN: Gab.ai is already looking great, and I love the aesthetic of it at the moment, but what other features are you planning to implement soon? Can you give us an estimation of when certain things will be introduced? AT: We have many exciting features on our product roadmap. Our core focus right now is providing as much value as possible to our people. Mobile apps are our top priority and we expect these to be ready in a month or two, but many users are enjoying our mobile website until that time. We are also working on an API to start building our developer community. Third-party developers have been treated terribly over the last decade by social giants. We welcome these developers with open arms who believe in and want to fight for free speech on the internet with us. Beyond this we are letting our community shape the product by crowdsourcing feedback on a dedicated Gab account and building based on user demand and need. You can sign up to join Gab.ai here, and follow both Charlie Nash and Andrew Torba on their official Gab accounts.